It was the night before a live eviction show on Big Brother 2014, but it was all quiet on the home front, well except for some pesky little ghosts that kept showing up! Yup, the HGs were scared by ghosts in the mirrors and warnings of danger coming, which means we are getting clues for the next HoH competition on Big Brother 16! Check out some highlights from yesterday below in our Big Brother 2014 spoilers! Nicole and Donny are on the block for Week 7, but Nicole knows she is the target and will most likely going home. She tried some campaigning the night before and seemed to get Zach on board, but Derrick squashed that little chance and it never resurfaced again. By the night, Nicole realized she was done and was picking out a pretty dress to wear tonight instead of the athletic wear for the HoH comp! Later at night, ghosts started appearing in the mirrors. It scared the HGs, but then they started searching other rooms and saw more ghosts. They were getting things shouted to them from production, but feeds cut whenever that happened. We are preparing for tonight’s HoH comp and they were studying the screen in the living room. Frankie was trying to take notes, but he kept getting yelled at. Donny was sleeping for the first half of it, but then joined the others eventually…he should have been there the whole time because he needs to win tonight on Big Brother 2014! The Detonators were talking plans for the future and they want Donny gone next week and they’ll put two members of the alliance on one side and Donny and another alliance member with him and they’ll throw the comp. 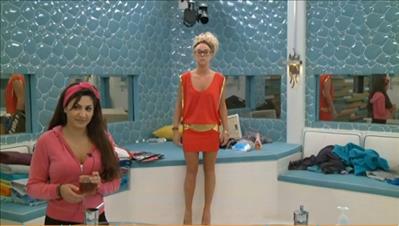 Then if Donny wins veto, they’ll put Victoria up in his place. However, we all know Derrick is working with Victoria and will not be letting her go. Let’s see how this plays out! Yawn…. I’ll be out of pocket a while today. Don’t let anything exciting happen while I’m gone!! Ugh!!!!! I don’t understand these people. They finally broke Nicole. It took half of the summer to do it (kudos to her) but they did it. She and Donny are too nice and good to play this game. And WTH is going on in Victoria’s head? Well, in Cody’s head too? They should just go ahead and tell the powers that be to give any chance they could have to win to Derrick and then let them go home. They are wasting their whole summer being there. They are 2 individuals with only one brain. A brain consumed with doing whatever they can to make sure Derrick wins this game. If you watched yesterday mornings conversation between Cody and Derrick, you will see that Derrick very smoothly led Cody to the conclusion that F3 should be him, Derrick and Victoria. And that it was all Codys idea. And if Donny somehow comes off the block next week then Frankie is the target. I have to admit that it was an amazing piece of manipulation. But right now there are too many reasons for me to list as to why i don’t want him to win. Shame on Derrick–a cop that talks out of both sides of his mouth. Keep Nicole –she is one of the honest ones! While I totally agree with you Karol, I’m more disgusted with the way these HGs are telling lies about each other. It’s expected that they’re going to lie to one another, but when they start putting words in other people’s mouths, it’s taking the game to a whole new level. The only consolation is that the forces that are in power right now will get a chance to experience what they’ve put others through. After all, there can only be one winner right? As of right now, my money is on Derrick to win. That don’t count in todays world Karol. Honesty gets you no where. Look at Donny he will be gone next week. CBS has this frigging show rigged. And I have watched from day 1 and refuse to watch next year. You wait and see if Frankie don’t win it all. He is playing for charity which CBS can write off their tax’s. Makes me sick to see that it is so rigged. Why would BB put ghost in the house when they know Nicole is terrified of them are they trying to torment her before she leaves. This season is really getting to me. I honestly think production has their hands in this to they want to win. What a joke. Well, all I can say is “Bless their little sadistic hearts!” For those of you who are not southerners, that is what a southern lady says when she doesn’t want to utter the “F” word. And if you could hear it instead of read it, you would hear the sarcasm in the inflection used! Oh, and it is always said with a smile! Welcome, Nicole is a cutie, I feel bad for her. I think there was something similar done in season 10. (ghosts, goblins, aliens). I’m sure it will have something to do with the HOH tonight. Or if not, an upcoming comp.